I agree with the concerns about venting outside and a lot of complications can set in if you are heating your shop, particularly in the area of heat loss and in the aspect of a properly functioning heater if you use natural gas, propane or similar heaters. I started with a shop vac / Dust Deputy combination and recently upgraded to a 2hp Grizzly G0548Z with 1 micron canister filter that I picked up from Facebook Marketplace for $200. The shop vac / DD still works nicely with the sander, router table, scroll saw and handheld equipment, but for the bigger machines I use the Grizzly and it does a good job of filtering. 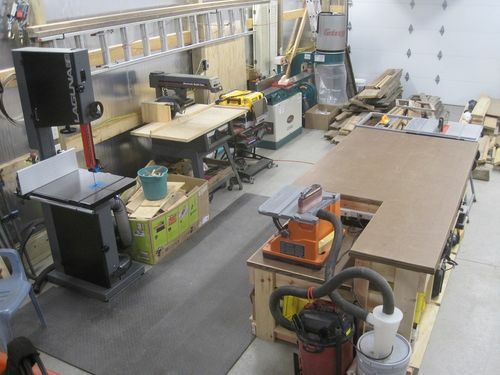 I have a 30’ x 40’ x 10’h workshop but only have one section dedicated toward woodworking. In the summertime I typically have a garage door open on each end of the shop with a 24” barn fan for cooling that additionally clears the air out. In the wintertime I keep things closed and the shop heated while working. I live in the middle of our 103 acre hardwood tree farm so the ultimate disposition of sawdust isn’t a major concern, but for my overall dust collection, the relatively simple system I have works quite well. I did recently pick up a Super Dust Deputy Cyclone at a scratch-and-dent sale at Woodcraft for $20 and would like to install it at some point which should improve things even more – though it works quite well as is.